When working with essential oils, every drop matters. Recipes, blends, and dosages all call for precise amounts of oils. More importantly, vendors of oils want to choose the oil dispensing system that provides customers the best user experience. The right size bottle and dropper can help customers get exactly what they want when using essential oils, which helps bring in future sales and build confidence in a brand. Here at Carow Packaging, we have gone the extra mile to bring the best choice for precise oil dispensing and measuring by creating EuroDrop. EuroDrop is an innovative and comprehensive dispensing solution. The design of the EuroDrop Dropper Insert features a specially formulated drop technique. Air enters the bottle when oil is dispensed, which allows a hydro-static action to control the flow of essential oils. EuroDrop Caps and Dropper Inserts are available individually or assembled in vertical and horizontal pour orientations with orifice sizes ranging from .55 mm to 1.8 mm. The recommended orifice size for essential oils is .7 mm to 1.00 mm, but varies on the viscosity of the oil and should be tested for flow rate. The vertical system is recommended for essential oils and can be purchased in orifice sizes ranging from .55 mm to 1.80 mm. The recommended orifice size for essential oils is medium in either .85 mm or 1.00 mm. Each of the EuroDrop bottles can be capped using a regular, child-resistant, tamper-evident, or child-resistant and tamper-evident cap. The primary focus for the sales of essential oils must always be the end user If customers are receiving a smarter type of packaging that controls dispensing, there is less mess involved. Less wasted oil saves the customer money, not to mention their sanity with spilled oils. The EuroDrop system covers all of these bases, as well as improving the buying experience for essential oil companies. The supplier benefits from the universal sizing of the EuroDrop. This packaging works with any 18DIN cap and 18DIN bottle. Any bottle with an 18DIN neck can fit any 18DIN cap, including treatment pumps, sprayers and applicators, making changing volume and product offerings a breeze. When you are working with essential oils, particularly those that are expensive, dispensing them accurately and efficiently is key. Some oils, such as argan, sandalwood, and vetiver, are more viscous and take a long time to dole out drop-by-drop. On the other hand, oils like peppermint, lemon, and tea tree will pour like a fountain. Getting the right dropper bottle, cap, and insert system for a particular oil is essential. This is where EuroDrop shines. The system comes in multiple orifice sizes in both vertical and horizontal orientations, which is an indicator of how the user holds the bottle when pouring. Therefore, you have drop alternatives within the single EuroDrop collection. You can even choose the plug seal system for essential oils that do not require a dropper insert. 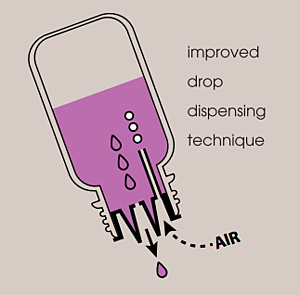 The EuroDrop neck, being the standard 18DIN, works with capacities ranging from 5ml to 120ml. This greatly expands product lines and opportunities for essential oil companies. The neck finish also provides an easy transition to other dispensers. For example, if you are looking to add a spray feature, the 18DIN Mesa Mist Sprayer offered by Carow Packaging works well while saving money not changing to a new bottle. EuroDrop alternatives all have their limitations. Dropper pipettes, orifice reducers and, of course not using any dispenser at all, do not offer clean and precise dropping. EuroDrop Caps and Inserts, however, provide an all-in-one precise measuring and dropping solution. What is EuroDrop Best Used For? EuroDrop is great for essential oil companies searching for a controlled flow rate for oils, tinctures, and extracts. EuroDrop is not ideal for oils that are overly viscous. In addition, if you are searching for a type of packaging for bulk or commercial use of essential oils, the EuroDrop is not quite the right choice. Again, with EuroDrop you are focused on precision and accuracy in the flow rate of essential oil products. Where can you get EuroDrop? EuroDrop is trademarked by Carow Packaging. While other vendors might sell a similar product, only Carow has the original EuroDrop. How did Carow Packaging become the first company to offer EuroDrop product packaging in the US? In 1994, Carow needed to find a faster solution for larger customers. These customers were using glass bottles with dropper inserts and caps coming from Germany. The problem was the lead time for getting this packaging was upward of 16 weeks from order placement to delivery. That was not efficient by any means for the customers, so Carow took a different approach. Bob and Steve Carow took the initiative and ordered a range of dropper bottles with inserts and caps. This gave Carow Packaging the inventory our customers needed minus the four-month wait. Our new system included a dropper insert that was confused with an actual dropper, so we needed a new name for the product. Our team came up with the term EuroDrop, which is now trademarked. This innovation led to Carow Packaging being a pioneer in this marketplace. Since 1994, Carow has continually invested intellectual and financial capital to update and expand the EuroDrop line of caps, dropper inserts and bottles to meet our customers growing demands for drop dispensing. For essential oil companies interested in a universally applicable and adaptable essential oil dispensing package, EuroDrop is the winner hands down. 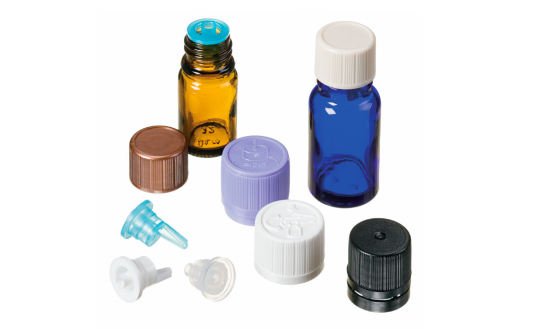 EuroDrop provides essential oil companies with a range of bottle, cap, and dropper insert options that best meet the expectations of specific types of oils. Shop for EuroDrop caps or continue by reading our Step-by-Step Guide to Successfully Capping Essential Oil Bottles. Within this thorough guide, learn how to choose the most appropriate bottles and caps, check incoming materials, and set up a torque system.